Ferret lovers of all ages are invited to bring their pet ferrets to B&B Pet Stop for the Extreme Ferret Races, an event that benefits Feeding the Gulf Coast. At the Extreme Ferret Races, as many as three ferrets at a time will speed through the 30-foot racetrack/ obstacle course, as the crowd cheers them on. The first ferret to make it to the finish line wins the heat. There will be as many heats as are necessary. Heat winners will race in the semi-finals – and the fastest pets will make it to the finals. Great prizes for the winners! 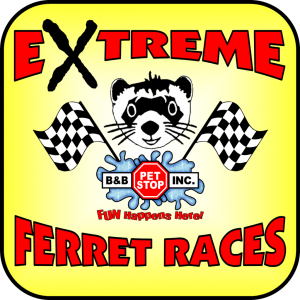 The Extreme Ferret Races festivities will take place at B&B’s facility, located at 5035 Cottage Hill Road. Practice runs start at 1:00 pm, race day registration begins at 1:30 pm ($8 per pet on race day, $5 per pet in advance), and races begin at 2:00pm. All registration + rental fees will be donated to the Bay Area Food Bank. B&B Pet Stop Inc., is a family owned and operated pet store and has been helping Gulf Coast families keep their pets happy and healthy for over 35 years. The company has a long history of giving back to the community by supporting the arts, historic preservation, animal rescue organizations, and through this event, Feeding the Gulf Coast.